The Woodwind section of an orchestra includes the Clarinets, Oboes, Recorders and Flutes. Many young children will be familiar with this group as the recorder is often bought as a cheap instrument to start to learn to play on. They consist of a tube with holes, which are either covered by your fingers or valves to play different notes and are usually made from plastic, metal or wood. Woodwind instruments either use reeds to make the sound or narrow airstreams vibrating over a sharp edge. Reed instruments use small rectangular pieces of reed plants in their mouthpieces. The reed vibrates very quickly creating a sound. In a single-reed instrument the reed vibrates against the mouthpiece. In a double-reed instrument two pieces of reed vibrate against each other. Descant which is about 30cm long and is most suitable for children. Treble which is about 45cm long and is the normal one for adults. Tenor which is about 60cm long and has metal keys to reach the lowest hole. Bass which is about 90cm long. Popular makes are the Yamaha Descant Recorder which can be purchased from the Music Room online shop for £5.99 and is good value for that price and the highly regarded Autos which is a little more expensive at £12.95 from the same shop. Details of the website are in our Useful Links section. The Clarinet is a single-reed instrument normally made from plastic and is cylindrical in shape with a bell end. They are played by blowing into the mouthpiece and reed, and pressing different combinations of the valves to make different sounds. Clarinets come in three main types - the Bass, The Alto (B Flat)and the E Flat. The B Flat is the most popular student version. The Flute is another non-reed instrument usually made of metal. It is cylindrical in shape and played by blowing across the mouthpiece which creates vibrations to produce the sound. Different notes can be obtained by pressing down varying combinations of the valves. It can a difficult instrument for a young person to get a good sound out of as it requires mastering the technique of blowing across the hole rather than into a mouthpiece. 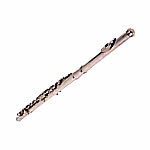 The Piccolo is similar to the flute but is smaller in size and has a higher range of notes. The Oboe is a double-reed instrument usually made of plastic. It is played by blowing into the reeds to create the vibration necessary to make the sound. A combination of valves are then pressed to obtain the desired notes. The Bassoon is another but rather large double-reed instrument. It is a heavy bass instrument and is therefore not ideal for younger children to learn to play on. The Saxophone is unlike the other members of the woodwind section which tend to be straight, in that it is made from a conical tube which then bends round and opens up into a bell end. It is a single-reed instrument which comes in a number of versions. These are mainly the soprano, alto, sopranino, tenor, baritone, bass, and contrabass. The alto is probably the best one for a beginner to learn on. The saxophone is usually made from brass and is now well established as a jazz instrument.